Calculations for the Electrical Exam contains 9 chapters of solid calculation instruction. 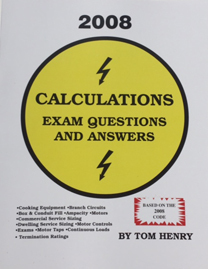 This book Calculations for the Electrical Exam covers Continuous loads, Branch Circuits, Ampacity and Correction factors for Ambient temperatures and Neutral conductors, Conductor terminations per 110.14(C), Advantages of using 90 degree Celsius conductors (THHN), Calculating Motor Overload protection, along with Overcurrent protection and wire sizing for the branch circuit and feeder for Single phase and Three phase Motors, Sizing Taps, Box/Conduit Sizing, along with Straight pulls, Angle pulls and U pulls for conductor sizes #4 and larger, Residential and Commercial Cooking Equipment, Single phase ranges on a three phase system, Calculating Commercial & Dwelling service sizes, Paralleling conductors, Panelboard Sizing, & MORE! OUR BEST SELLER!! Includes five Journeyman and five Master practice exams & answers! Over 350 pages of excellent calculation study material! This book is also included in our Journeyman and Master book combos. Prepare for the journeyman exam with a review of Ohm's Law, the Journeyman requirements in the Code and Calculations for the Electrical Exam. Save $23.00 over the cost of these study-aides if purchased individually.